Congratulations to Lai-Sheng Wang on winning the Sahlin Faculty Excellence Award for Research, Scholarship and Arts. Washington State University annually presents three Sahlin awards, recognizing excellence in teaching, public service, and research. 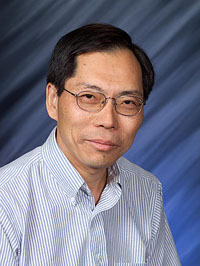 An Affiliate Senior Chief Scientist in the Fundamental Science Directorate at Pacific Northwest National Laboratory and a professor in the Department of Physics and Astronomy and the Program in Materials Science at Washington State University-Tri-Cities, Lai-Sheng Wang is a world leader in nanoclusters research. For example, Lai-Sheng and his colleagues created hollow nanoscale cages of gold atoms, the first known metallic equivalent of the buckyball. Lai-Sheng showed that the most stable form of gold clusters undergoes shape transformations, a finding that addressed a key issue in fundamental cluster science: understanding the structural evolution of clusters from a single atom/molecule towards the bulk solid. The work has potential applications in energy sciences. In addition, Lai-Sheng has pioneered the study of solution molecules in the gas phase and developed novel experimental techniques to address fundamental questions of ion solvation and solution chemistry. During his 20 years in research, Lai-Sheng has written or co-written more than 250 publications. His work has been featured in important journals, including Nature and Science. He is active in the scientific community, working with the American Chemical Society, American Physical Society, Materials Research Society, and the American Association for the Advancement of Science. His contributions as a researcher and a professor have been recognized with numerous awards, including the Humboldt Research Award, Guggenheim fellowship, the National Science Foundation creativity award, and the Alfred P. Sloan fellowship.